Here the 9th-century mosque of Abd al-Rahman I meets 16th-century gothic and renaissance elements of the Cordoba Cathedral. A gothic pinnacle and sculpture stand over an islamic column next to later renaissance semi-circular arches. It's a complicated blend of styles because it coincided from the transition between the gothic and the renaissance, a time in European history stimulated by a new interest in ancient classical knowledge (preserved in great part by Islamic scholars and disseminated back into Europe by way of Spain) and the intellectual revolution caused by Christopher Columbus' discovery of the new world, 29 years earlier. To make matters ever more complicated, purely artistic considerations have been clouded by ideological ones. 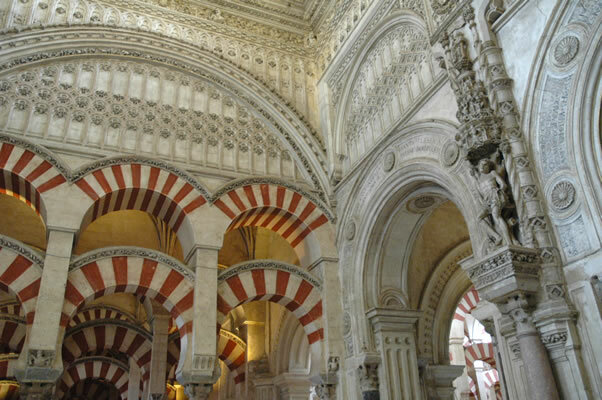 Opinion: Summing up the Mosque-Cathedral of Cordoba?